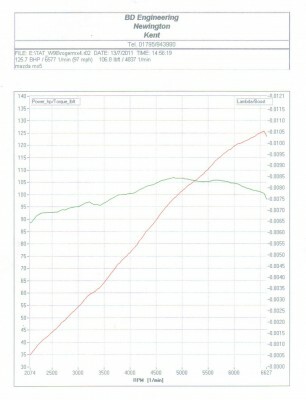 To be exact, 13th July 2011 was the first dyno run we recorded with the Mazda. The final figures were 125.7 bhp @ 6577 rpm with 106.8 lb-ft torque. I remember thinking at the time if this is good or not as our only benchmark was that a standard engine is 115 bhp and 100 lb-ft torque when new (not 20 years old!). At this point the cylinder head had been skimmed but we’d soon learn that this was nowhere near enough power to reach the podium! As with any development project you must be able to reliably test various changes and be confident that the testing equipment isn’t skewing your findings. We quickly settled on using a local rolling road / dyno for testing out different modifications; BD Engineering in Sittingbourne. I’d recommend Andy to anyone interested in doing the same. 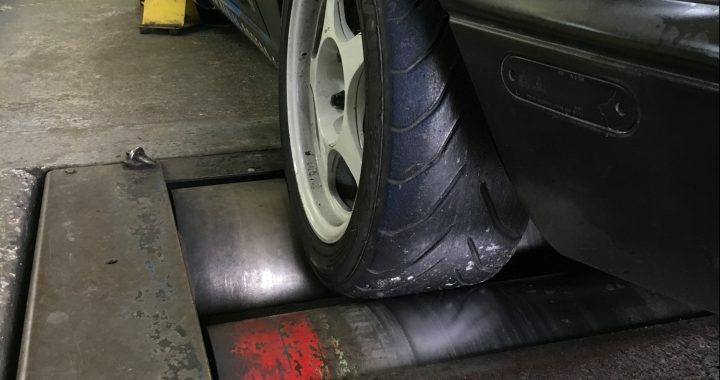 This was one of the very first lessons we learnt from the various tests on the dyno. If you test 5 ECU’s back-to-back there will be one that will consistently give an extra 2hp. Do the same with air flow meters and there’s 3hp found. Now part of this may be because of manufacturing tolerances, and also the way different parts have aged. In a single make championship that we were racing in at the time, this was the level of preparation needed to achieve good results. Over time, and after a number of different cylinder heads and running parts, we got to a point where we had a competitive engine (July 2013). It was now producing 135.7hp, so up exactly 10hp from where we first started. Progress! 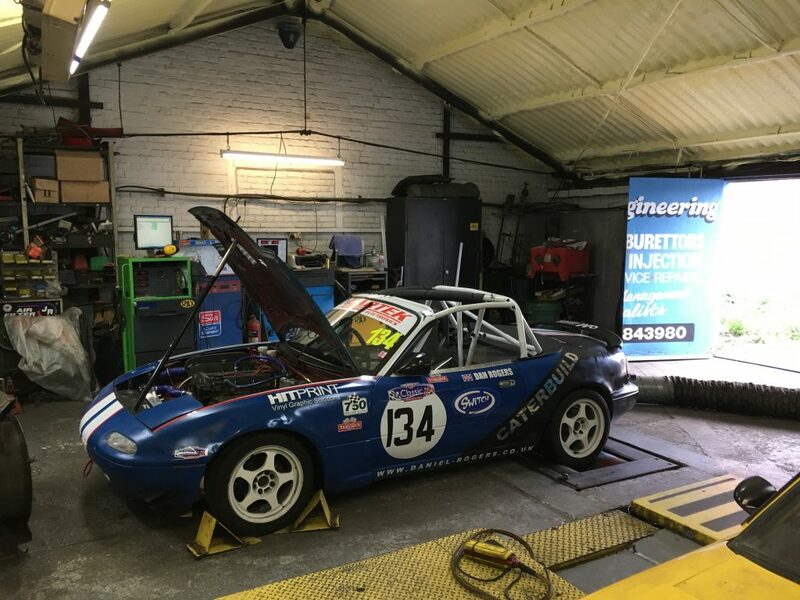 I wanted to move away from the restrictions of the Mazda MX5 Championship and develop a car that could compete in the mini endurance series with other makes and models. As part of this we turned to Blink Motorsport, who had produced my cylinder head, to supply a throttle body, and race cam package. The aim was to unlock more power from what was already a very good starting point. First run it made 151.8hp which was slightly less than we had anticipated. We spoke with Andy and Blink Motorsport about potential solutions and we settled on the fact that the standard exhaust manifold was restrictive. 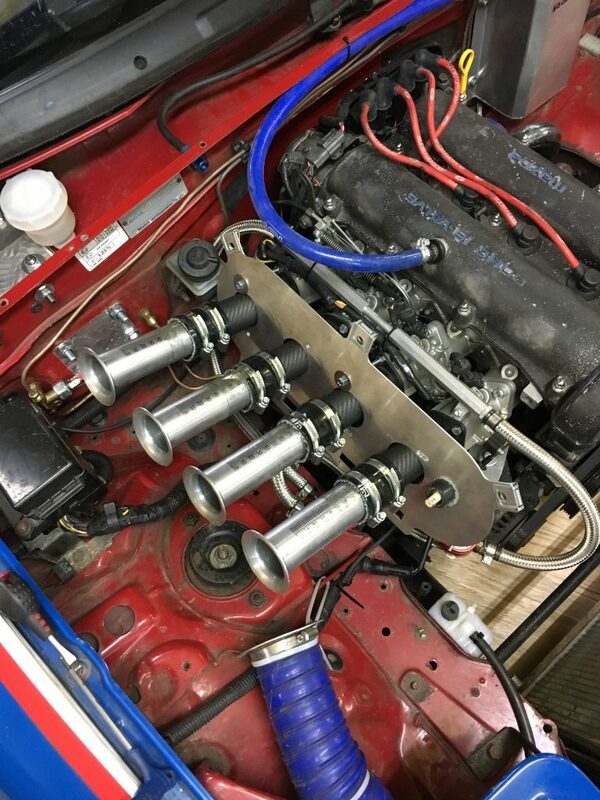 A new RacingBeat 4-1 manifold was purchased and immediately unlocked 12hp! After the exhaust manifold made such a difference I researched about other items that could be worth changing. One of the big things that came up was the length of the intake trumpets. Effectively, by varying the intake length you can change shift the position of the power curve. 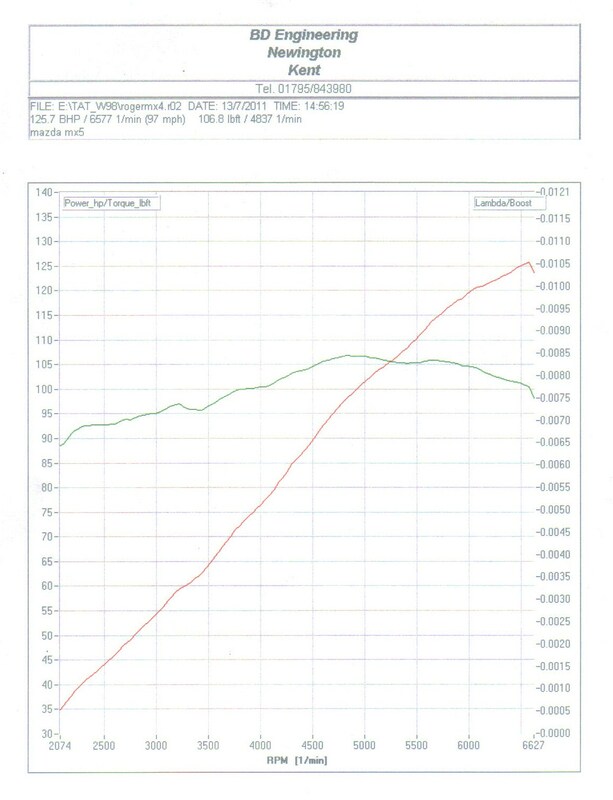 We bought some adjustable length intake trumpets for testing, but soon found that the longer we ran them, the more power we found. I bought some carbon tubes and then rigged up a solution that would give us serious levels of adjustment. Peak power didn’t change significantly but lower down the revs at 6,000 rpm for example we found as much as 8hp. The optimal length of intake trumpet was then identified and we settled on this as the final setup.